Thanks to my fine filmmaker, Sean Marc Nipper of Reel House Films, for these short films on marketing beer to women. How To Market Beer To Women: Where’d the name come from? Thanks to everyone who came out the book events in Denver last week, during the Great American Beer Festival. Kokopelli Beer Company got us off and running (and sipping) by hosting 2 events: the first for beer pros & media, talking about the book, what’s in it and how to use it. The second was a screening of my TED talk for everyone. Both groups were engaged, fun and participated actively. A tour of the Denver Museum of Nature & Science by Dr. Nicole Garneau was a real treat. I’m a tour junkie and the behind the scenes is always the most interesting ‘exhibit’ around. 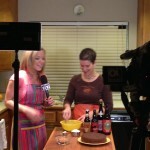 TV time with very fun & sharp Heather Mills, KDVR FOX Denver, provided a morning boost! Their whole team is very smooth, calm and professional. Here’s the clip. Visit Denver then took credentialed media around on buses to 3 breweries in Denver. As is their style, they take good care of us as guests and the bonus of Ed Sealover as our guide sealed the deal. 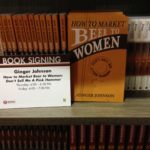 Book signings at GABF itself were good – both Thursday and Friday nights. The opportunity to meet with and talk to people who know the book holds real (ROI style) value is always gratifying. The big World Premier Book Launch party at Lannie’s Clocktower Cabaret, with my venerable crew Diane, Dave & Marty, was a success. Our partner in this event was Ska Brewing – pints up to them for ‘getting’ there’s something to this. T’was fun to have a crew of Ska peep present & participating. Wrap it up by attending a Brewers Association Press Conference – super useful insight – and then a special session of Paired – beer & food pairing at the GABF – and you’ve got quite the week! The cherry on top was a radio interview with Gary Valliere, American Craft Beer Radio, Saturday, as we eased on down the road home. People met, reconnections with friends and colleagues, many conversations & a few beers, books discussed signed & sold. It’s all part and parcel to my world in the beer community. How do beer and chocolate go together? What’s the business element? How do you combine seemingly unrelated ideas productively? It’s great to share ideas live with the KTVL Channel 10 Crew. Cheers to Ashley Carrasco, Morning Reporter, who I joined in the studio for the first time. All the others had been in my kitchen or afield. It was a tasty treat to be there in the television studio with the entire crew: Ashley, Liz, Will, and Whitney. Enjoy and tune in next time. You heard me right. Beer in smoothies can be just the ticket for a refreshing summer drink. Why let the spirits mixologists have all the fun!? Here are a few ideas and pointers in using beer in smoothies. 1. Like any smoothie, work together with complementary flavors. Use hearty chocolately stouts in ice cream based smoothies and shakes. Adding malted milk powder will enhance the body and echo the malty flavor contribution of the beer. 2. Add modest amounts of beer. A little goes a long way, so start with smaller quantities (a few tablespoons) and build as desired. 3. To avoid over-foaming, use ingredients that are in the same temperature range. Drastic differences between beers, the container you’re mixing in and other ingredients will cause some assertive carbonation release. 4. Do beer tastings in advance to find out what flavors in which beers stand out would serve you well in your smoothie and beer drinks adventures. Does it have a grapefruity crispness? Then use fresh citrus. Does it have a moderate malty sweetness? Then try lush fruits and vegetables with low acid attributes. If you’ve never tried a beer smoothie, now’s the time. Having made both beer floats and beer malted milkshakes before, I can tell you it’s a fun and unexpected experience. Go on, get your smoothie on! Go Here: Visit your local beer store and talk to the crew to help you pick out a few flavors of beer you wish to try. Try This: Beer floats are classic: rich stouts with a scoop of coffee, chocolate, or vanilla ice cream are waiting. Deep stone fruit porters beg for a scoop of raspberry sorbets. Pour a grapefruity IPA over a dollop of lemon gelato. When you think of broadcasters, do you think of a particular person? Perhaps you think of a style, personified by a particular person. 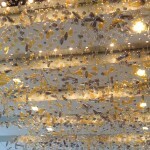 Did you think of a kind of broadcaster, like sports, when you read the post title here? A wise colleague told me once you should only do color commentary IF you’ve played the game before. I’d agree. This particular colleague had been invited to give color commentary (she’d done it in the past too). Plus she’d been a very active participant in the activity she was asked to call and was up to date on the current landscape of the activity. Good fit all around, especially for the end listener who is relying on a professional and skilled commentator. As a kid I remember making fun of the golf commentators. My sister and I would snicker at the Saturday afternoon golf tourneys my folks would occasionally watch. We’d watch a bit then remove ourselves to another room, so as not to totally ruin it for my parents. We then proceeded to make fun of the narrative, and becoming instant commentators ourselves mimicking whose we’d seen. We’d expound in our own goofy way til we were laughing so hard no sounds were coming out of either of us. My own childhood experience aside, commentators should only be commenting and guiding conversation if they’re knowledgeable, reputable and diplomatic. Color commentary involves way more than simply watching an activity and then giving a running narrative. The audience and the subjects will all be best served by those who are qualified to do so. What a ball! 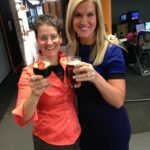 To work with a reporter interested in offering useful and enjoyable information about beer and food. Thanks to Molly Trotter, Reporter at KTVL Channel 10 for the engagement. The recipes are on the news channel website with the links. I hope you enjoy whipping one or more of them up for yourself. I’d be remiss if I neglected to mention and thank Caitlin Conrad, another very able-bodied Reporter at KTVL for our first few segments together, as well as one segment with Jenica Villamor, Reporter. Kingsley Kelley, station General Manager, is due recongnition for his support and unfailing fun professionalism he brings to everyone who gets to meet him. Enjoy the clips – we’ll share more in the future, as they happen.